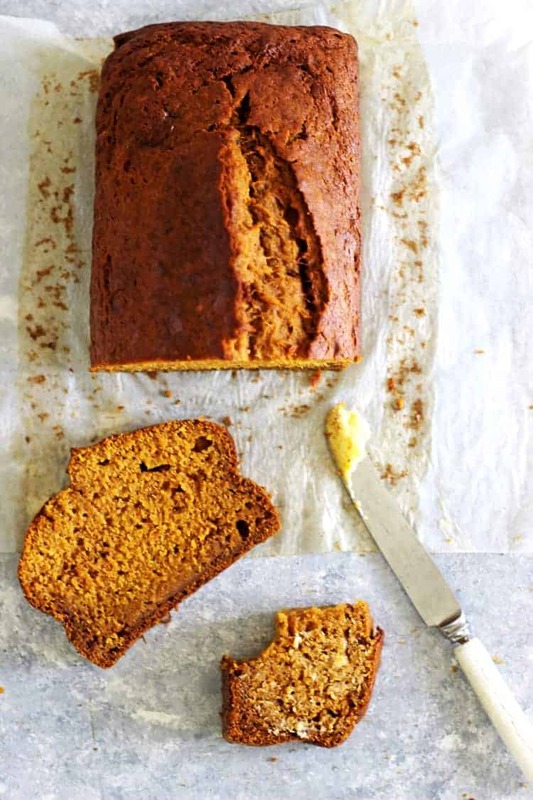 This easy recipe for moist, delicious pumpkin spice bread (or pumpkin loaf) will be your new favourite quick bread! Hi, it’s me, still confused about the seasons. 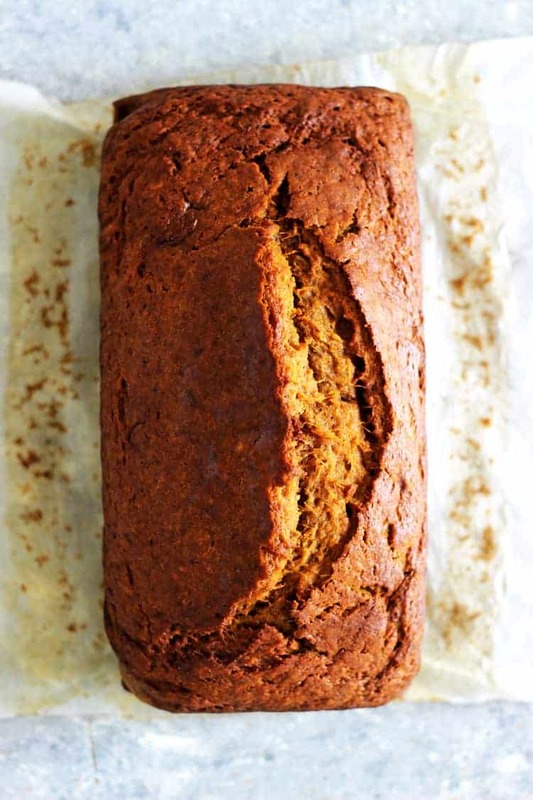 But I’m not even a little bit sorry to be sharing the recipe for this outrageously good pumpkin spice bread with you today! This was just supposed to be a test recipe. 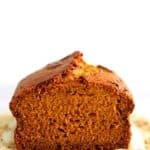 Something to make now to use up the pumpkin puree in my fridge and save the recipe to tweak next year. 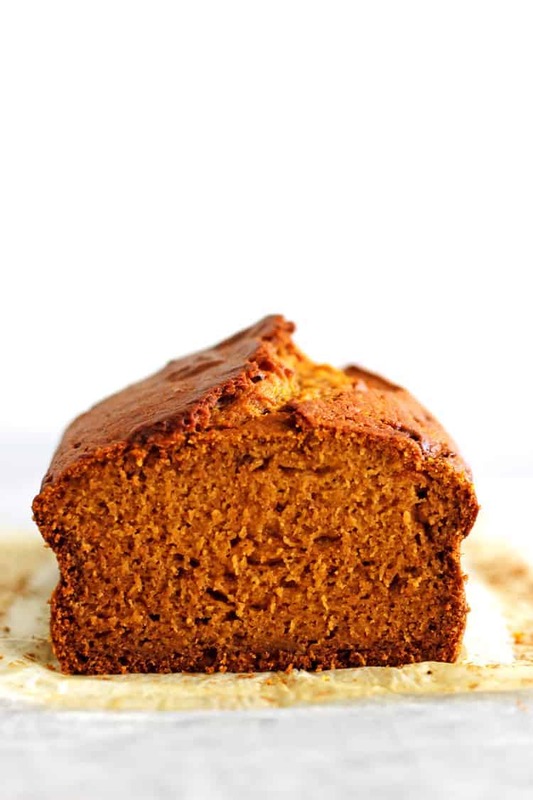 You know, when it’s actually autumn and pumpkins are actually in season and we are ready for warm cosy recipes. But then I made it. And ate it. And continued to eat it and may have actually eaten almost the entire loaf because it was unbelievable. And I knew it would be wrong on so many levels to not share it right now. Plus, I’m still working through a glut of pumpkins that we harvested in May so I’ve got a bit of pumpkin going spare! 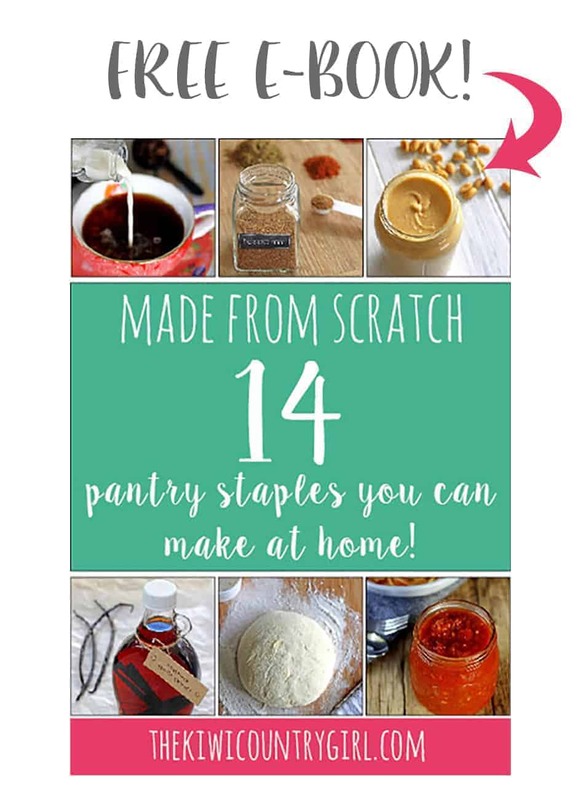 And I couldn’t just give you a recipe for homemade pumpkin pie spice and then leave you hanging! 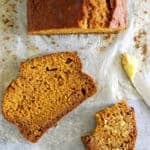 This recipe is based on my easy banana bread recipe. 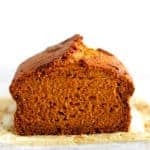 I simply swapped the banana for pumpkin, used oil instead of butter to make it extra moist and added a bit of brown sugar in place of some of the white sugar. And of course, a generous amount of homemade pumpkin pie spice to give it that undeniable autumn flavour. 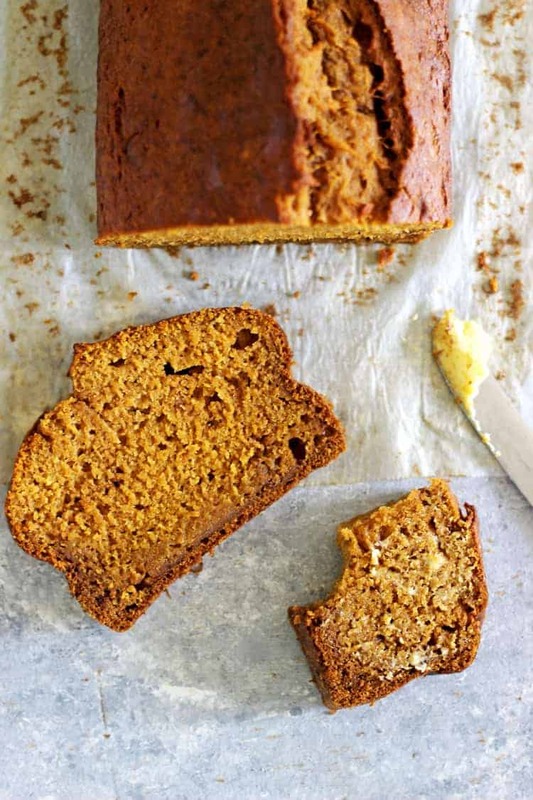 It is full of flavour, so simple to make and will be your new favourite quick bread recipe at any time of year! Plus, it’s made in one bowl so less dishes, which we are always happy about! Now that I’ve got autumn out of my system I’m off to spring clean my house and eat ice-cream while I try to remember that summer is coming! Pre-heat the oven to 180°C/350°F and grease or line a loaf tin. 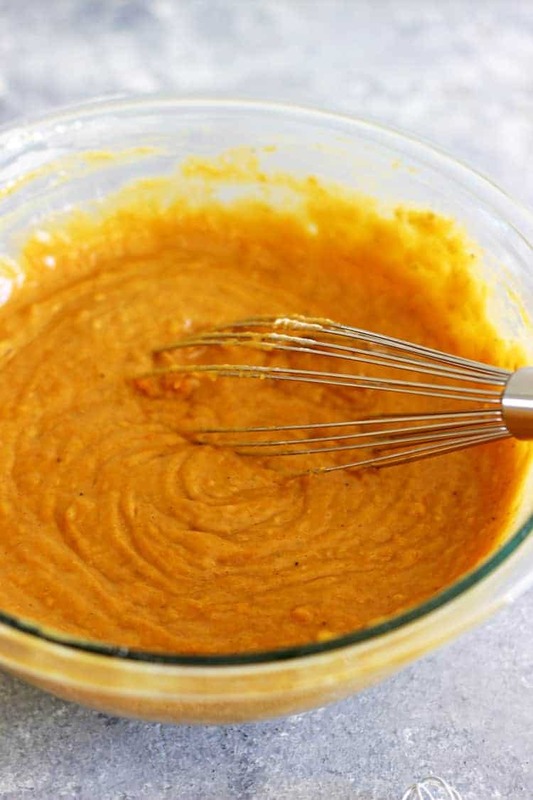 Add the pumpkin, oil, eggs, sugar and vanilla to a large bowl and whisk together. Add the flour, pumpkin pie spice, baking soda and salt to the bowl and whisk together again, until all ingredients are combined. Pour the mixture into the prepared tin and bake for 45-50 minutes until the top is golden brown and a toothpick inserted into the centre comes out clean. Allow to cool in the tin for 10 minutes before turning out onto a cooling rack. Slice and serve immediately, or keep in an airtight container at room temperature for 5 days. 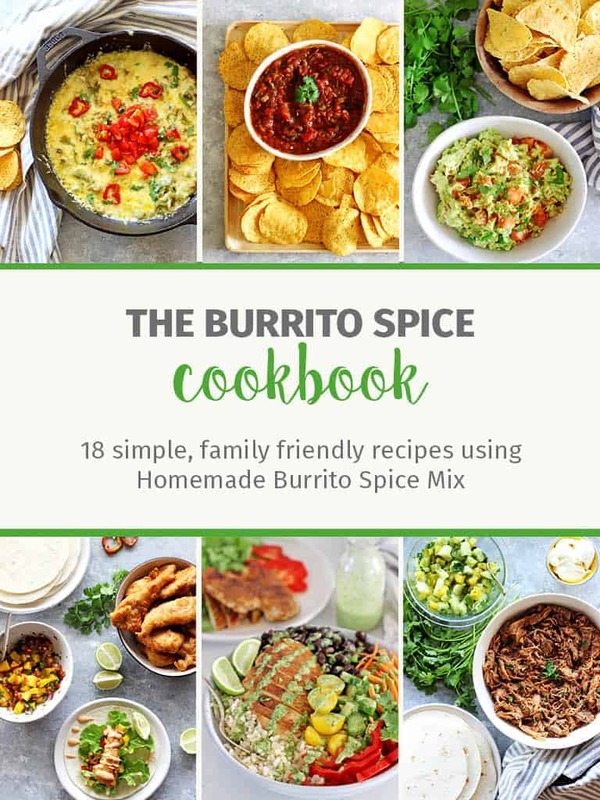 You may also wrap and freeze the whole loaf, or individual pieces that can be pulled out of the freezer and put straight into a lunchbox. I need to know if 1 slice equals 291 calories or is that the whole loaf, sounds delic.